Open the drawing that you want to run ETRANSMIT on. If the drawing is already open, save it. You have to save the file before using ETRANSMIT. Click the Application button and choose Publish→eTransmit from the Application Menu. The Create Transmittal dialog box appears. On the Files Tree tab or the Files Table tab, remove the check mark next to any file that you want ETRANSMIT not to copy with the main drawing. Unless you have assigned custom font mapping, you can omit the Acad.fmp file (in AutoCAD) or acadlt.fmp (in AutoCAD LT). Select a transmittal setup from the list. Transmittal setups contain settings that control how ETRANSMIT processes the drawings and creates the transmittal package. Click the Transmittal Setups button to create new setups or modify existing setups. The default Standard transmittal setup works fine for most purposes. In any case, you should view the settings (click the Modify button) just to see what options you can change if you need to later. 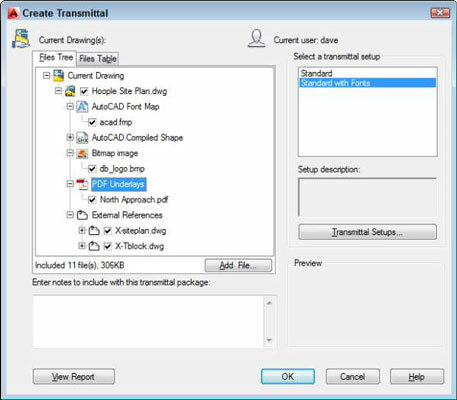 If you want AutoCAD to include SHX and TTF font files, including any custom fonts that you’re using, you must turn on the Include Fonts setting in the transmittal setup. Many custom fonts work like licensed software: Sending them to others is just like sharing your AutoCAD program DVD or USB installation media with others: illegal and unethical. Don’t share custom text fonts outside of your organization. You see a report listing the files that ETRANSMIT will copy, along with warnings about any files that it can’t locate. Review the report and make sure that ETRANSMIT was able to find all the files. If files are missing, find them and move or copy them to the location where ETRANSMIT expects to find them. Specify the name and location of the transmittal package. ETRANSMIT creates the transmittal package (which is a Zip file by default). Zipping creates a single, tidy, compact package of all your DWG, DGN, DWF, PDF, raster image, plot style table, and font files — all ready to be e-mailed.